Generally papad is served after meal in almost every occasions and festivals. 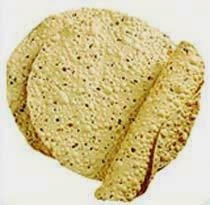 The demand of papad is found all throughout the year especially in festive season. With the Automatic Papad Making Machine you can make papad and after packing it you may sell it in local market or supply orders. With the Automatic Papad Making Machine you can make upto 40 kg papad per hour. You need a Dryer Machine also. Now you may dry it with Dryer Machine or in sunlight. It needs 2 hp motor to operate the Papad Making Machine and 1 hp motor for Mixture Machine and 1 hp motor for Dryer Machine. And it needs 220 to 440 volts to operate the Papad Making Machine. The price of varies upon production capacity of the Papad Making Machine. The price of the Automatic Papad Making Machine which can make upto 40 kg papad is approximately Rs. 1 lakh 50 thousand. The price of Dryer Machine is approximately rs.80,000. The price of the Mixture Machine is approximately rs.40,000. The price of the hand-operated Papad Making Machine is approximately Rs.10,000.